Last week, I posted a picture of tiny using her very own potty. Though I would have called myself crazy months ago. It's commonly referred to as elimination communication or infant potty training and it is fascinating. To be totally honest, I had heard about it shortly before I had Lucia and it sparked my curiosity. I just wasn't ready to deal with. So like any new mom, I had tiny, we put her in diapers, we washed diapers (we use cloth), we put them back on her, and the cycle simply continued for 8 months. But the poop forces are strong. and visions of a post graduation trip to Africa came flooding back. but after learning more about the process...I think I was the naive one. Babies have been communicating their needs with their caretakers in other countries for years. Just as a baby tells you it's hungry or tired, it also can tell you it needs to eliminate itself...if you are paying attention. All these past poops and pees, I had simply looked at tiny and watched her go in her diaper. Why I had never thought to set her on a potty of some sort is beyond me. I guess years and years of diaper advertisements had me believing that there was no other option. Really, in theory the practice is simple. According to diaperfreebaby.org, one can observe their baby for signs and cues such as fussing, squirming, and tensing and when you feel baby is ready, hold them over the desired elimination area, prompt them with the cue of choice and watch the magic happen. 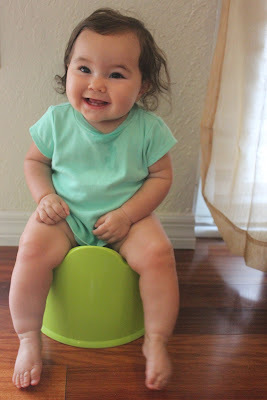 but because I waited until she was 8 months and curious to discover EVERYTHING around her...reading her potty cues, at least pee cues has been tricky. But we have adapted, and after going diaper less around the house, I have come to learn her schedule. Now, I can usually set her on the potty, make the "sssss" sound that I have been making every time I see her go, and low and behold the flood gates open. Do I catch every single time? Do we still use diapers out? But many times and with enough "pottytunities" it stays dry (yup that's another cool term). Wow this is so interesting! I definitely want to try this because I've read so many people have difficulty with potty training. This seems like an easy way to get a head start.